Who hasn’t wished they could see the future? But if you really got your wish and every time you touched someone crazy images flashed in your brain, would you still consider it a gift? 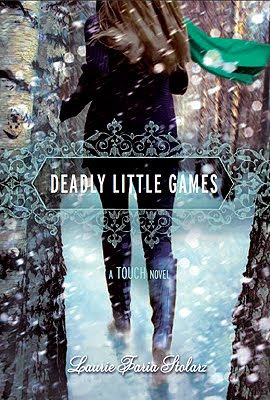 I’m not so sure, but I’d like to find out when I read GCC Member Laurie Faria Stolarz’s new novel, DEADLY LITTLE GAMES, which just debuted through Disney/Hyperion Books for Children. High school juniors Camelia and Ben have discovered a powerful bond: they both possess the power of psychometry, the ability to see the future through touch. For Ben, the gift is a frightening liability. When he senses a strong threat or betrayal, he risks losing control. Camelia’s gift is more mysterious. When she works with clay, her hands sculpt messages her mind doesn’t yet comprehend. Before either one has a chance to fully grasp their abilities, a new danger surfaces, but this time, Camelia is not the target. Adam, a familiar face from Ben’s past, is drawn into a puzzle he can’t solve. . . and his life is on the line. As the clues pile up, Camelia must decide whether to help him and risk losing Ben or do nothing and suffer the consequences. But in these games, who can be trusted? Laurie: Traveling cross country Spain, not having train fare, and having to hide out in the bathroom until the conductors were completely done stamping tickets. I’ve road-tripped in Spain myself! But I never managed to sneak out of train fare. Kudos! Laurie: I’ve always wanted to be a writer. Since before I could even write, I was creating stories and plotlines for my dolls and having them act out plays. Then, when I actually could write, I’d write out the scripts and make edits and adjustments I went along. Laurie: My friends surprised me by renting a limo which we took out on the town. Laurie: I’m definitely an outliner. I like knowing ahead of time what my main character wants and why and what he or she needs to learn in order to get it. My outlines do typically change as I discover things along the way, but I like the safety of an outline before I begin. Laurie: I actually got the contract in the mail before I even got a phone call. I thought that was a little odd, so I wasn’t really sure it was real.